A major challenge for many patients is experiencing symptoms of a medical condition that is yet to be diagnosed. They find it difficult to explain or describe them when they visit the doctor. 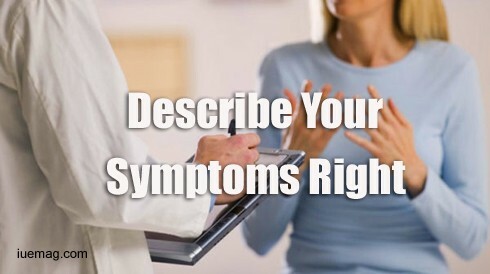 It is important to be able to describe your symptoms as clearly as you can to enable the physician to diagnose the health problem and provide effective treatment. Doctors are trained to guide their patients during medical examinations and routine checkups as they describe their symptoms. Explain your symptoms in a concise and clear way that your physician will be able to comprehend. The basic aspects of symptom descriptions include telling the doctor about the physical symptoms and how you feel. Terms such as dull or sharp pain are descriptive enough to let your physician know the extent of discomfort or distress. - Explain to the physician the actual site of the symptoms. Be specific about the location of pain or discomfort and whether the symptoms are being experienced on other parts of the body. - Inform your doctor about how long it has been since the symptoms began. The more accurate you can be about the dates, the easier it will be to determine the cause and extent of the problem. - Providing information about how often the symptoms occur can also the ease the process of knowing what is causing the symptoms. Let the doctor know when the symptoms are ore noticeable or of there any factors that trigger them. It is advisable to write a list of symptoms before visiting your doctor. This will make it easier for you to give descriptive information and also ensures that you remember to note down all the symptoms and their effects on your general wellbeing. You can carry your list with you and highlight any symptoms that are related to certain activities, food, times or any factors that make them worse. You should also consider whether or not the symptoms are disrupting your normal life. - Create a list of important and pertinent questions that you can ask your physician during the visit. - The questions should deal with your current concerns and symptoms. This will help you learn as much as you can when you see the doctor and maximize on the time that you have to explain your symptoms. - Always remember to be as descriptive and specific as you can by providing the details that the doctor needs. This is crucial for an accurate diagnosis and monitoring your health during treatment. If you are comfortable with your doctor, there is no reason to be ashamed or embarrassed about any symptoms. Being honest will make it easier for the doctor to come up with a diagnosis. Physicians have been trained to handle a wide range of medical conditions and there is no symptom or concern that they are unfamiliar with. All the information that you provide to your doctor is confidential. Doctors usually begin their exams by asking the patients about their medical problems and providing a summary of the situation will give them insight into what may be causing the symptoms. Any facts, figures or references stated here are made by the author & don't reflect the endorsement of iU at all times unless otherwise drafted by official staff at iU. This article was first published here on 16th January 2017. Isabella Rossellinee is a freelance editor and writer.